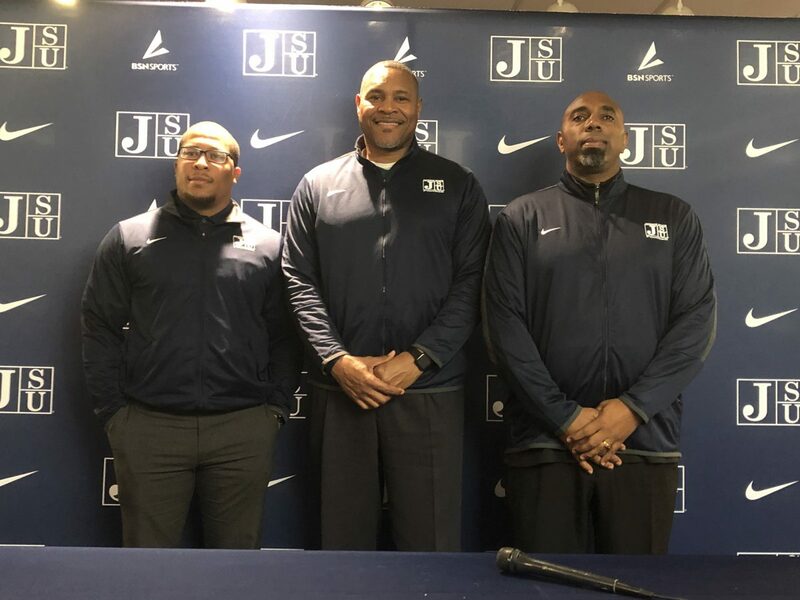 Jackson State’s new coach is hoping his new recruiting class can bring about a new era for the proud program. Jackson, Miss. – When the Jackson State football team lost in its season finale to Alcorn State 24-3 – a game that would have secured the Tigers a spot in 2018 Southwestern Athletic Conference (SWAC) championship – then Tigers interim head coach John Hendrick was not even sure if he would get offered the head coach position. Eleven days after the Tigers disappointing loss in the Soul Bowl, JSU announced that “Big John” as he sometimes referred became head coach and the real work began for Hendrick, hiring a new coaching staff over the winter holidays and securing good talent for the future of the football program. Hendrick and his coaching staff solidified the idea of bringing in talent to help restore the Tigers football program to past glory on National Signing Day. He stressed the importance of speed and athleticism in the Tigers 2019 recruiting class. “We are very pleased with this recruiting class,” Hendrick said. JSU signed two running backs in Alexander and Clarke, both of whom can run the ball effectively and be dynamic playmakers. Per JSU coaching staff, Alexander will most likely line up in the slot as a wide receiver.
.@HBCUGameday RB recruit T. Alexander will most likely line up in the slot per coaching staff. “Oh, what a dynamic guy,” Hendrick said about Clarke. The Tigers signed four offensive linemen, a big priority for the offense headed into the new season. After the 2018 season, Jackson State lost Charles Paige, Brandon McCoy, Daunte Fisher and Donnell Paster. “These guys were really essential for this class,” Hendrick said. Ron Dickerson, the Tigers offensive coordinator, said he is most excited about the competition coming in but putting emphasis on the offensive linemen. “Offensive linemen are the baseline of this offense,” Dickerson said. At the wide receiver position, the Tigers added players with speed and size. “Sanders is a little slight but has great height and eventually will be a nice size guy but they are dynamic,” Hendrick said. “Bracey is a decent size guy, a make you miss kind of guy,” Hendrick said.
.@HBCUGameday Mendenhall High School standout QB Christian Allen has committed to Jackson State @GoJSUTigers . JSU coaching staff says Allen will line up as wide receiver. “When you play football, you want to have guys that make the defense look at you and say man we better stay on top of him or it’ll be six points,” Hendrick said. The quarterback position will be an important one for the Tigers’ offense next season. Although JSU has two returners in Derrick Ponder and Jack Strouse, there will be a fierce competition during the spring to determine who will start under center for the Tigers i the fall. “We needed young guys,” Hendrick said. Defensively, like the offensive commits, the Tigers brought in more speed and athleticism. “I think we have put together a class with a bunch of guys that can run, tackle well and they understand football,” Hendrick said. Lionel Stokes, the Tigers defensive coordinator, said Honer is a comparison to Tigers’ Keontre Hampton at the linebacker position. “You can put him in the middle,” Stokes said. Jackson State will kick off the 2019 season on the road as the Tigers face Bethune Cookman in the MEAC/SWAC Challenge on Sept. 1 in Atlanta, Georgia.